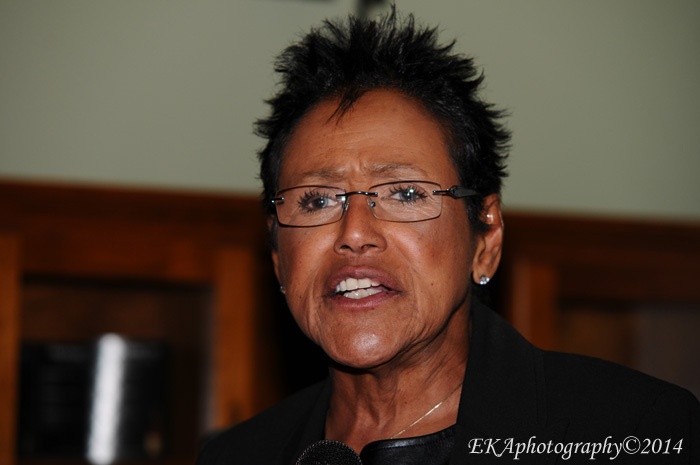 The week prior to TV One’s airing of a Black Panther-themed episode of “Celebrity Crime Files,” former Panther Chairperson Elaine Brown was in the news. 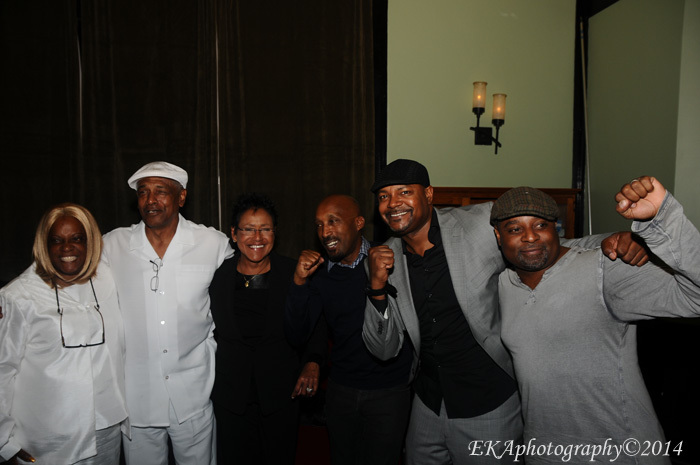 Brown’s latest project, Oakland & the World Enterprises — announced at a press conference alongside Oakland Mayor Jean Quan, City Councilmember Lynette Gibson-McElhaney, representatives from congresswoman Barbara Lee’s office, Housing and Community Development director Michele Byrd and neighborhood activists David Roach (founder of Mo’Betta Farms and the Oakland International Film Festival), and D’Wayne Wiggins (an original member of Tony Toni Tone) — is a West Oakland business center which will create employment opportunities for formerly incarcerated people. 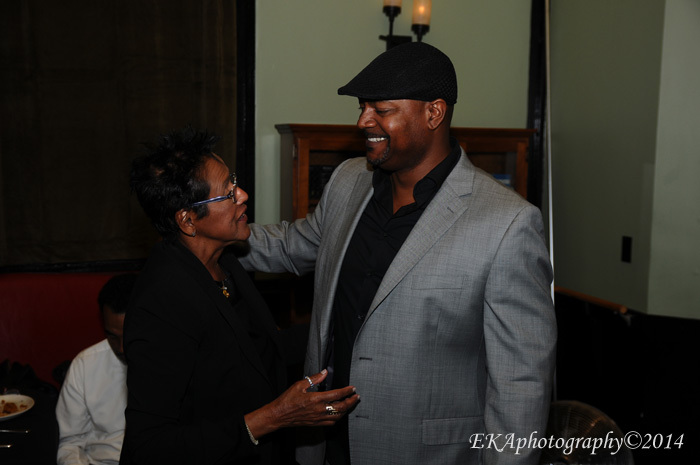 Brown was also on hand, as was Wiggins, radio personality Marcus Osborn and former Lumpen member James Mott, for a special VIP screening of the Celebrity Crime Files episode, hosted by producer P-Frank Williams (an Oakland native), at Berkeley’s 44 restaurant. Titled “Violence is Necessary,” the episode – which airs tonight, Nov. 3rd— traces the history of the Panthers and their frequent run-ins with authority figures. Narrated by a gravelly-tongued Ice-T, the episode pulls no punches in its retelling of the story of how Merritt College students Huey Newton and Bobby Seale founded a revolutionary organization which openly challenged the Oakland Police department and the FBI, and how the Black Panthers declined in the late 70s and early 80s, decimated by government counterinsurgency, legal troubles, violence, sexism, and drugs. The episode’s first half is its most compelling, as Ice-T’s voiceover introduces “a new generation of civil rights activists coming out of Oakland, California.” Frustrated with the perceived ineffectiveness of Dr. King’s nonviolent, civil disobedience approach in the face of rampant police brutality against the black community and spurred to action by the assassination of Malcolm X, Newton and Seale organized like-minded recruits to open-carry guns and observe police actions in then-majority-black neighborhoods of North and West Oakland. But, as the episode notes, the Panther platform also included political education, self-defense, legal aid, and free breakfast for children as well as the right to bear arms. At the time, it’s stated, OPD was “almost exclusively-white.” The lack of integration in the department, as well as its practice of recruiting officers from the Deep South who were less likely to have tolerant attitudes toward black people, put the Panthers on a collision course which culminated in the shooting death of Officer John Frye, allegedly at the hands of Newton, who’d been pulled over for a traffic stop after OPD identified his vehicle as a Panther car. Even today, the details are sketchy: there was a shootout, and Frye was mortally wounded. But ballistics later revealed that all the bullets fired came from OPD weapons. Newton was sentenced to jail, where he spent months in solitary confinement and wrote the book “Revolutionary Suicide.” Although his conviction was later overturned, his arrest and incarceration succeeded in neutralizing the Panther leadership and fermenting dissent and internal conflict among the organization. The episode also traces the story of how Seale came to be one of the Chicago 8, and his trial, during which he was chained, shackled, and gagged, and eventually sentenced to four years in prison for contempt of court. With Newton and Seale off the streets and the FBI’s COINTELPRO program infiltrating and assassinating Panther members, a climate of paranoia began to infuse what remained of the Panthers. “I remember the sense of not being able to trust people,” former Panther Joan Tarika Lewis is quoted as saying. A Panther member suspected of being an informant is murdered, as is another man suspected of having an affair with Seale’s wife while he was in prison. The murder of John Huggins and Bunchy Carter by a rival organization (later found to have been on the FBI payroll) is also recounted by Huggins’ widow Ericka. While the first part of the episode strikes a note of contemporary relevance around Ferguson, Trayvon Martin, and Oscar Grant, the second half is much more somber, as it recounts how Newton changed after being released from prison and how in Brown’s words, “unrealistic expectations” were placed on him. “You felt he was a superhero,” Wiggins says at one point. Newton’s activities became less revolutionary and more criminal; he surrounded himself with thuggish bodyguards and developed a bad cocaine habit. Author Rickey Vincent (“Party Music”) describes how doing blow with Newton in the backroom of Oakland bars became a bragging right for those inclined toward “radical chic.” Newton’s continuing legal issues, which included being accused of the murder of a prostitute and embezzlement from a Panther school accelerated the decline of the organization, which finally disbanded in the early 80s. Newton is portrayed as an increasingly tragic figure, who comes to an ignoble end in 1989, murdered in a dispute over crack cocaine. By that time, Seale was long gone, having fallen out with Newton years past. The episode highlights his run for Mayor of Oakland in 1973 as one of the last high points of the Panthers—he finished second, but the political base he helped to build led to the election of Oakland’s first African American mayor, Lionel Wilson, in 1977. The use of archival footage and testimonial interviews with surviving former Panthers makes the show a compelling, eye-opening watch. During the screening, all the side conversations in the restaurant ceased while the episode played. And even though the subject matter is heavily weighted toward examining the Panthers’ legal and criminal history, it strikes a balance between describing police and government actions against the Panthers, and alleged crimes committed by the group. The end result is more revolutionary than perhaps one might expect from a nationally-syndicated TV program, and a show which qualifies as must-see viewing, whether one is a Panther historian, or a neophyte who simply wants to learn more about what’s behind their leather-jackets-and-beret mystique — and why it has endured for 45+ years. Categories: TV review | Tags: "Violence is Necessary", Black Panthers, Bobby Seale, Celebrity Crime Files, COINTELPRO, Elaine Brown, Ericka Huggins, Huey Newton, James Mott, Joan Tarika Lewis, legacy, Oakland, Ten-Point Program, TV One, TVOne | Permalink.